The Summer Forecast: Lots of Lilies! Lilies are a gardener's dream. These hardy, easy-to-grow perennials naturalize easily, returning in greater numbers year after year. Some reach towering heights of 6' or more. 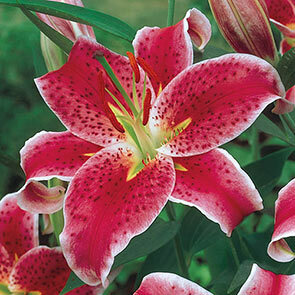 Lily blooms share a basic, elegant appearance featuring large, triangular petals that open wide and curl back. Some are more exotic looking, with painted petals speckled with dots, while others feature more solid colouring and take on a regal form. Lily blooms do not just look delightful, but some release a fragrance that can be downright intoxicating! For lily lovers, the only thing better than having their favourite flowers blooming in their gardens for part of the summer is having them bloom all season! That's why we created our new Summerlong Lily Collection. 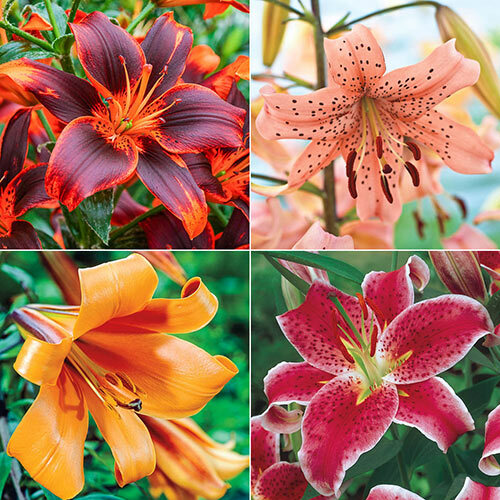 Included in this money-saving assortment are varieties with successive blooming periods that will provide a brilliant, nonstop display lasting the entire summer. 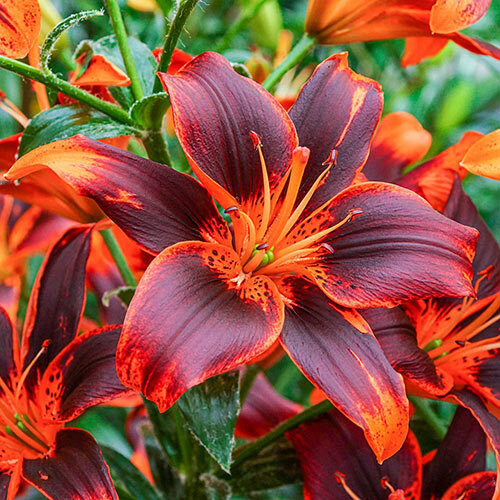 First, Forever Susan Asiatic Lily and Pink Giant Tiger Lily will flower from early to midsummer, at which time African Queen Trumpet Lily will join in the colourful, floral fray. Finally, Stargazer Oriental Lily will bloom from mid to late summer! 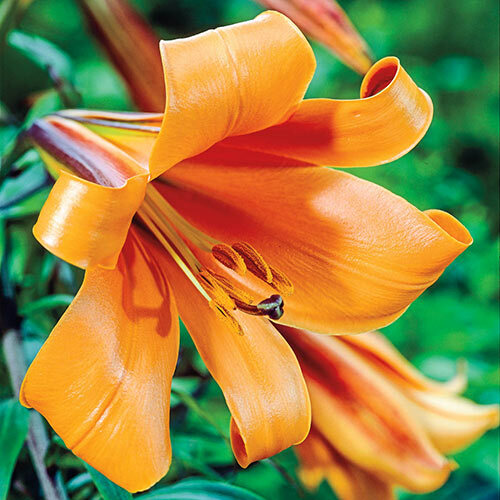 Forever Susan Asiatic Lily: Usher in the summer sun with this pretty, upward-facing lily. Presents a shiny, near-black look with vibrant orange tips and a plum-spotted orange throat. Grows 24-36" tall. African Queen Trumpet Lily: Even the hottest temperatures don't faze this beauty! Huge, fragrant, trumpet-shaped blooms are soft apricot with broad strokes of bright tangerine at the centre. Grows 4-6' tall. 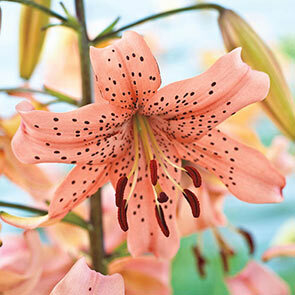 Pink Giant Tiger Lily: Light pink, 4" blooms have gracefully recurved petals speckled with black dots. Flowers are unscented but are nonetheless appealing to butterflies and hummingbirds. Grows 40" tall. Stargazer Oriental Lily: Perhaps the world's most popular lily! Huge, skyward-pointing blooms boast an exotic beauty and a strong, intoxicating scent. Flowers reach 6-7" across with pink-red petals edged in white and freckled with dark pink. 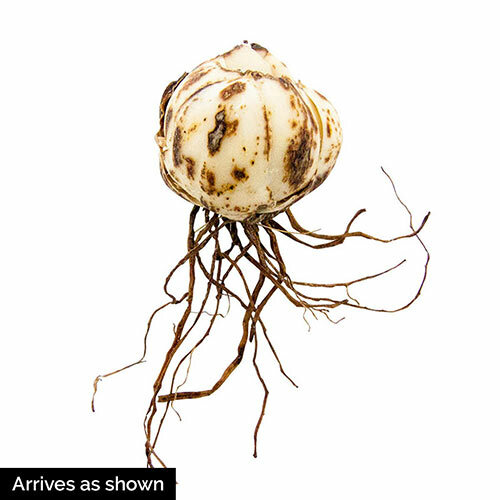 Grows 24-36" tall.